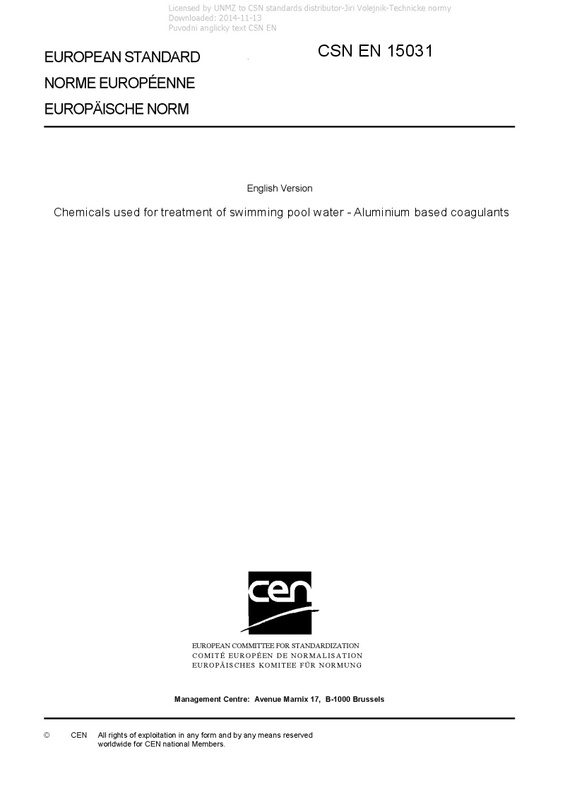 EN 15031 Chemicals used for treatment of swimming pool water - Aluminium based coagulants - This European Standard is applicable to aluminium based coagulants (aluminium sulfate, aluminium chloride (monomeric), aluminium chloride hydroxide (monomeric), aluminium chloride hydroxide sulfate (monomeric), sodium aluminate and polyaluminium chloride hydroxide and polyaluminium chloride hydroxide sulfate) used directly or for the production of formulations for treatment of water for swimming pools. It describes the characteristics of aluminium based coagulants and specifies the requirements and the corresponding test methods for aluminium based coagulants. It gives information on their use in swimming pool water treatment. It also determines the rules relating to safe handling and use (see Annex B).